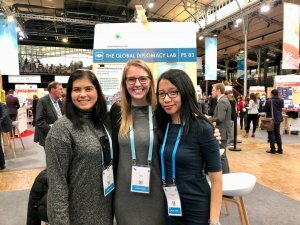 GDL Members Elsa D’Silva and Eirliani Abdul Rahman represented the Global Diplomacy Lab at the first-ever edition of the Paris Peace Forum from 11 to 13 November 2018. The Paris Peace Forum is an annual event that is intended to promote governance solutions in five key areas: peace and security, the environment, new technologies, development and inclusive economy. 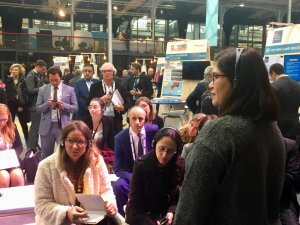 It was created at the initiative of French President Emmanuel Macron to provide a platform for government officials, international organisations and representatives of civil society from around the world. Its open, bottom up format aims to enable these actors to launch collaborative initiatives and track two exercises, as well as mediation efforts and bilateral dialogues. 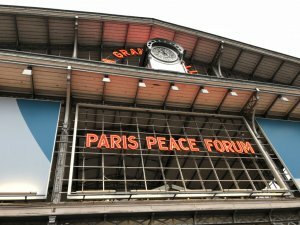 The next Paris Peace Forum is scheduled to take place in November 2019 and is now calling for proposals. Being one of 120 selected projects in the Space of Soulutions, GDL Members Elsa D’Silva and Eirliani Abdul Rahman had the opportunity to meet various project leaders and organisations over the three day period. 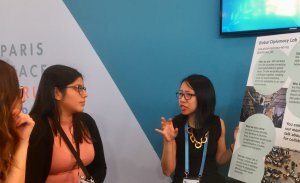 Apart from one on one conversations, they held a pitch on the second day as well as a longer, more in-depth “meet up” on the last day of the event.Their one hour long session used the issue of “Women-friendly Cities” to apply a creative tension format. Asking the participants from various professional backgrounds, countries and different genders a series of ten difficult questions, they encouraged them to take a stand on the issue as well as share their personal experiences. The questions they asked included the following: “Is your city friendly to women and girls?”, “Do you feel safe using public transport late at night in your city?” and “Is the mobile phone a tool for security?”. All the women present confirmed that they had experienced some form of sexual harassment in public spaces. The men who participated listened respectfully and took in the varying view points as well as sharing their own stories. This storytelling helped to ascertain the fact that sexual violence is a common issue. At the end, there was agreement that there is a need to create spaces for such discussions and dialogues in order to create greater understanding.